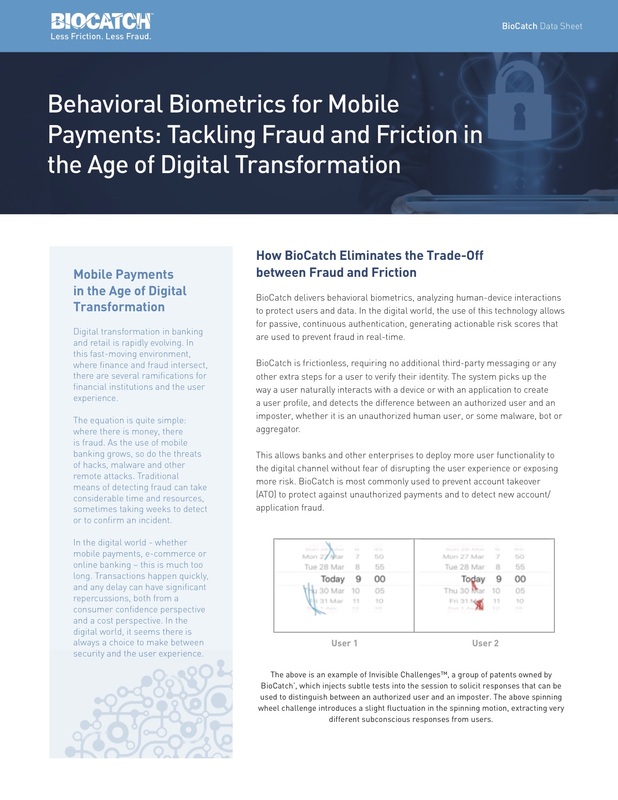 By enabling the user journey from identity proofing, authentication, monitoring online sessions and beyond in the web and mobile channel, BioCatch supports a multi-channel strategy generating significant returns on investment for top tier clients around the world. Learn more about our capabilities with these data sheets. According to a recent UK Finance report, British banking customers lost £500m to fraudulent schemes in the first half of 2018 alone, the majority of which came from “unauthorised fraud” (i.e., hacking of user accounts.) 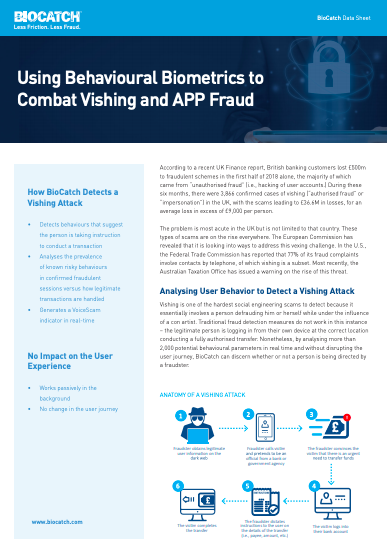 During these six months, there were 3,866 confirmed cases of vishing (“authorised fraud” or “impersonation”) in the UK, with the scams leading to £36.6M in losses, for an average loss in excess of £9,000 per person. The problem is most acute in the UK but is not limited to that country. These types of scams are on the rise everywhere. The European Commission has revealed that it is looking into ways to address this vexing challenge. In the U.S., the Federal Trade Commission has reported that 77% of its fraud complaints involve contacts by telephone, of which vishing is a subset. Most recently, the Australian Taxation Office has issued a warning on the rise of this threat. The ongoing cat-and-mouse game between fraudsters and security experts has generated a variety of methods to prevent identity theft and ease the authentication process. 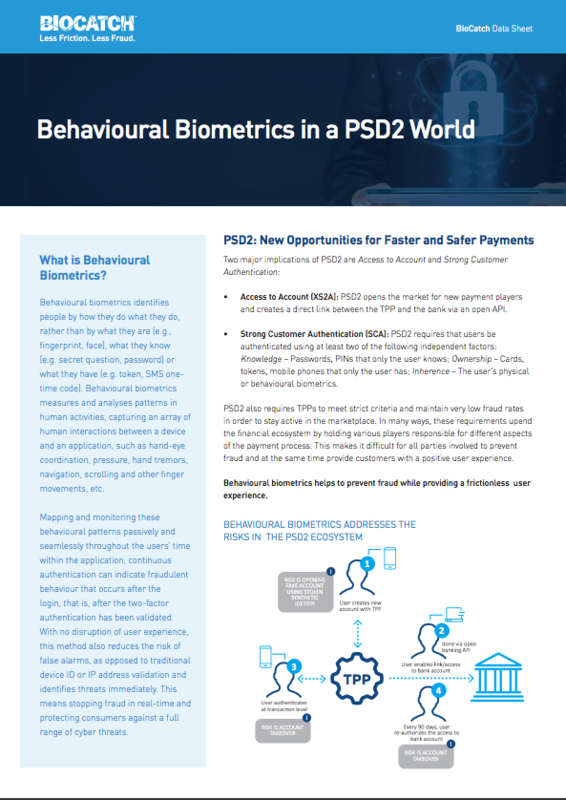 Behavioral biometrics upends the paradigm, profiling and analyzing user behavior as opposed to what they have or what they know. 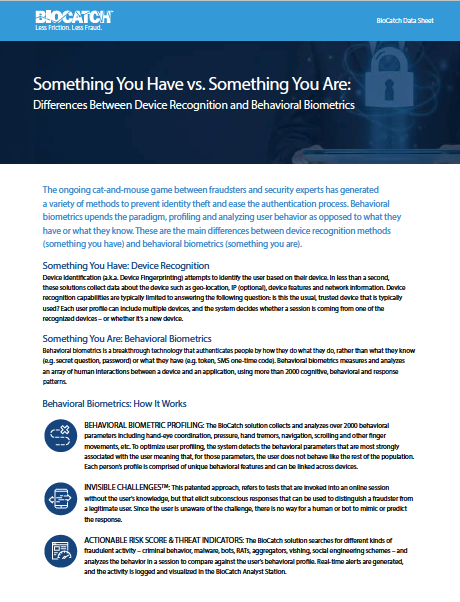 These are the main differences between device recognition methods (something you have) and behavioral biometrics (something you are). Payroll systems are the life line of any company or organization. 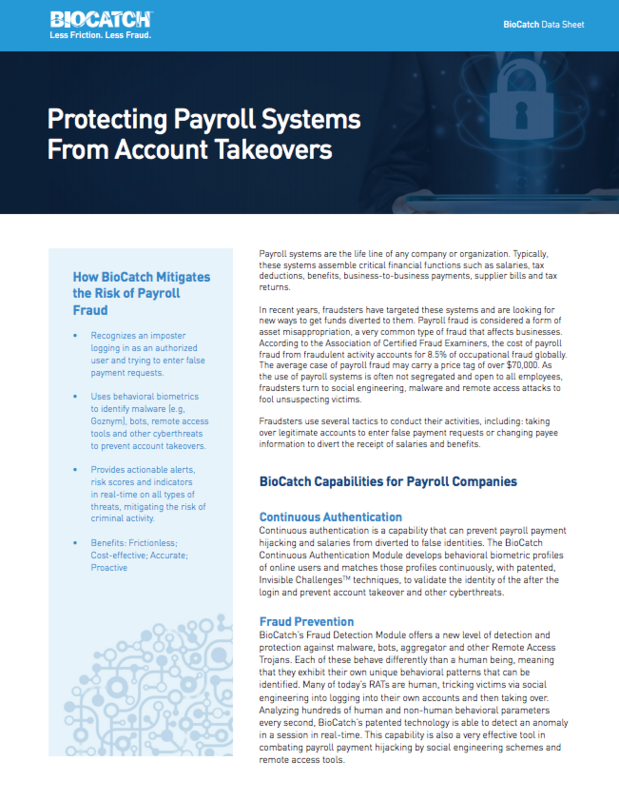 Typically, these systems assemble critical financial functions such as salaries, tax deductions, benefits, business-to-business payments, supplier bills and tax returns. 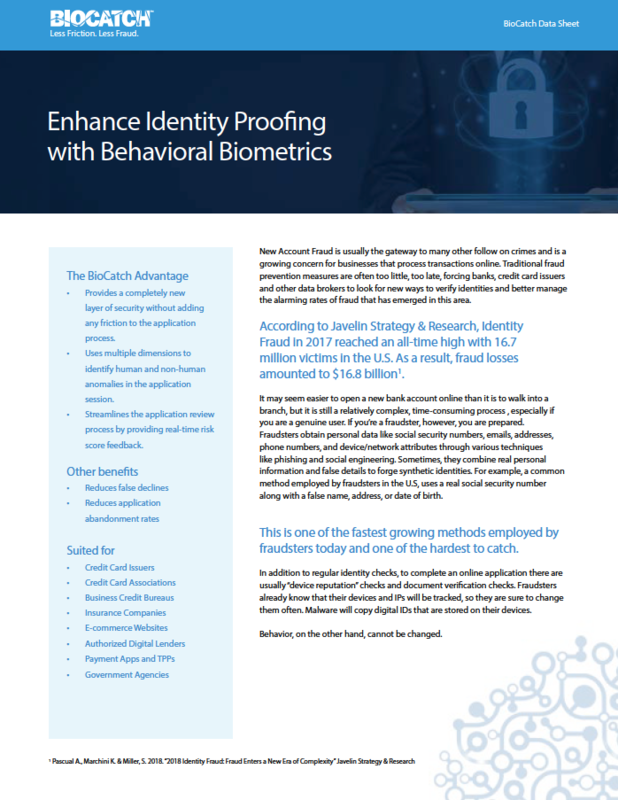 Behavioral biometrics is a breakthrough cybersecurity technology that identifies people by how they do what they do, rather than by what they are (e.g., fingerprint, face), what they know (e.g. secret question, password) or what they have (e.g. token, SMS one-time code). 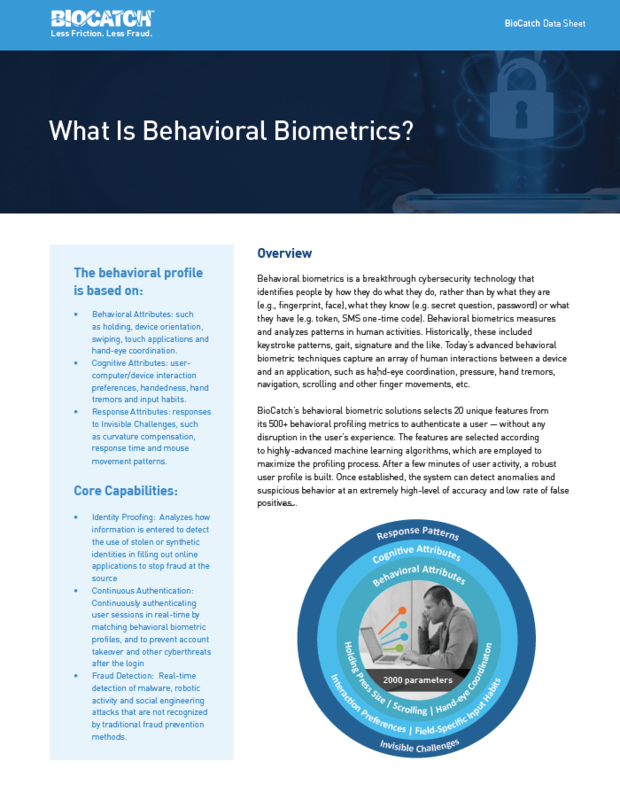 Behavioral biometrics measures and analyzes patterns in human activities. Historically, these included keystroke patterns, gait, signature and the like. Today’s advanced behavioral biometric techniques capture an array of human interactions between a device and an application, such as hand-eye coordination, pressure, hand tremors, navigation, scrolling and other finger movements, etc. The global insurance market is a multi-trillion-dollar market worth more than $4.5 trillion in gross insurance premiums (2015). In 2016, the gross insurance in premiums in the U.S reached $2.67 trillion with $1.5 trillion in paid claims. Digital transformation in banking and retail is rapidly evolving. In this fast-moving environment, where finance and fraud intersect, there are several ramifications for financial institutions and the user experience. The equation is quite simple: where there is money, there is fraud. As the use of mobile banking grows, so do the threats of hacks, malware and other remote attacks. 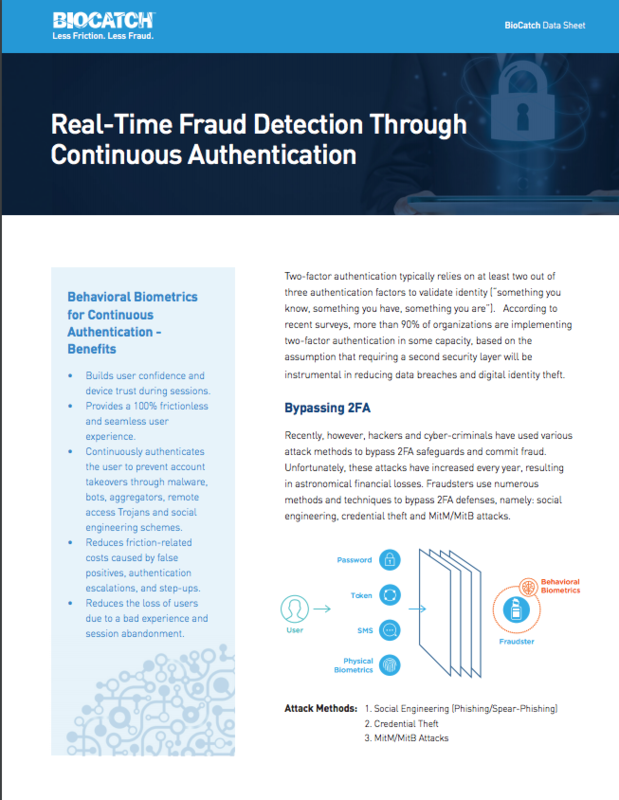 Traditional means of detecting fraud can take considerable time and resources, sometimes taking weeks to detect or to confirm an incident. In the digital world - whether mobile payments, e-commerce or online banking – this is much too long. Transactions happen quickly, and any delay can have significant repercussions, both from a consumer confidence perspective and a cost perspective. In the digital world, it seems there is always a choice to make between security and the user experience. New Account Fraud is usually the gateway to many other follow on crime and is a growing concern for businesses that processes transactions online. 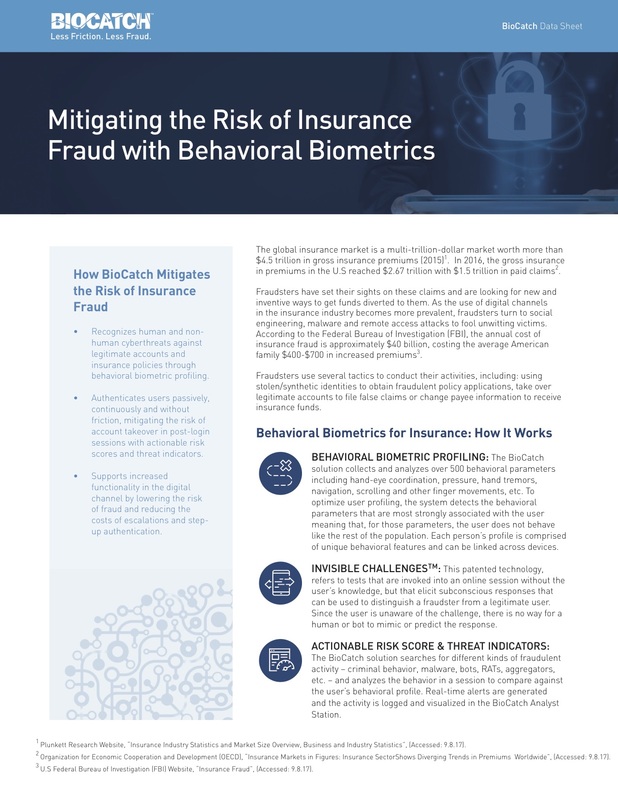 Traditional fraud prevention measures are often too little, too late, forcing banks, credit card issuers and other data brokers to look for new ways to verify identities and recognize the alarming rates of fraud that has emerged in this area.